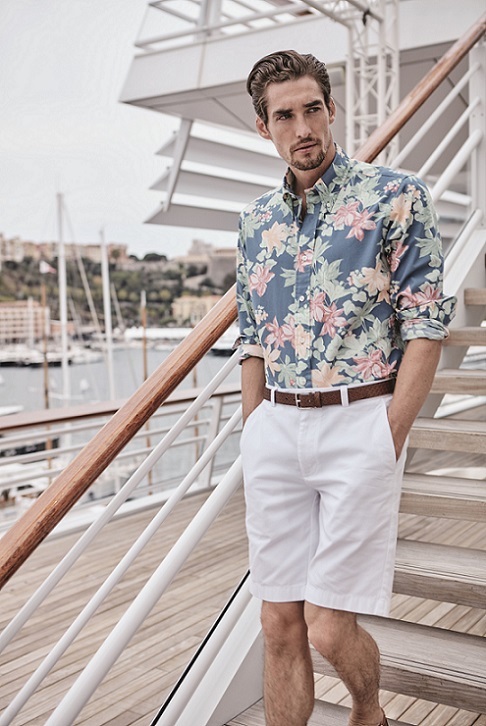 Brooks Brothers Summer 2017 Men's and Women's Collections are inspired by seaside resort, with the main color of navy blue, as well as other bright and sharp colors, combined with floral or palm tree blue prints, the collections perfectly express the theme of seaside voyage. The men’s collection moves from a Lakeside neo-nautical theme to a leisurely deck side inspiration. Comfortable linens are colored with soft brights and highlighted with whites and neutrals. Timeless classic Brooks Brothers fabrics and patterns including seersucker, linen and gingham are freshened by styling with white pants or garment-dyed chinos. 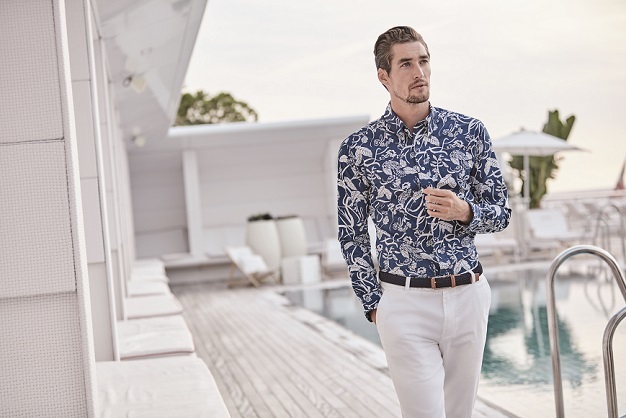 The pool’s deep blue waters influence our indigo-inspired group of micro-patterns, reverse prints, and dobbies. Linen/cotton slubs add newness for wovens and knits, including our favorite Signature Tartan shirts. The second summer delivery layers on saturated colors resulting in a tonal dressing paired with white and navy. The pinks and mid-greens are inspired by wild flowers and printed on shirts and knits. The Women’s Collection voyages from the ocean cliffs of Newport, Rhode Island, to the shimmering beaches along the Côte d’Azur. By playing with proportions and feminine constructions, the collection offers ease and wearability. It is shown in sandy neutrals, sun-bleached whites, chambray blues, pale rose pinks, and navy accented with touches of coral. A flirty off-the-shoulder sundress in silk cotton voile features the exclusive print - Palm Tree Blue. Eyelet cotton lace dresses in either a drop-waist or a classic shirt dress cinched at the waist offer a feminine and elevated look. Luxurious textures include glazed and embroidered chambray linens, corded cotton and embroidered linens. Prints include nautical stripes, as well as ocean and botanical garden floral.